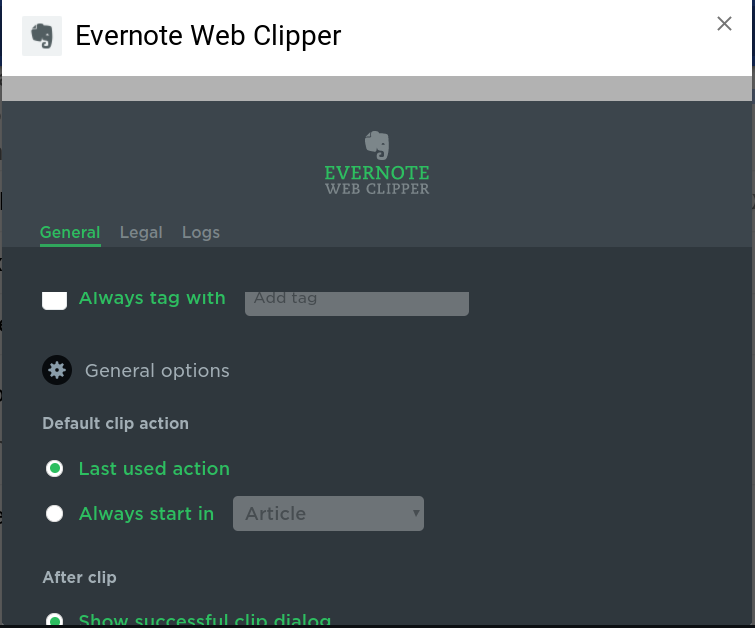 We wanted to let you know that we've released version 7.1 of the Web Clipper on Chrome. It returns much of the functionality from Clipper 6 users have provided feedback on including highlighting, remarks and creating and searching notebooks. Highlighting: you can highlight content from a clip by selecting text. Creating and Searching Notebooks: you can now search or create a new notebook to store content from the Notebooks list under the Organize section of the Clipper screen. Spaces: if you're an Evernote Business user you can now choose to clip content to a space. You can download the latest Clipper from the Chrome Web Store here. Please let us know if you spot any other issues. Chantal and the rest of the Clipper Team. Hey @Chantal Leonard - I think you just made a lot of people very happy to get this functionality back again. Thanks for fixing this. Evernote came in for quite a lot of criticism for replacing the previous stable version with a cut down, apparently temporary fill-in. Are you able to give any more background as to why that was necessary? Yes, thanks for putting the features back. FYI, this release reset settings, like 7.0 did I think. This is fantastic news! Actually made my day. Thanks!! I was wondering about that. Is it going to happen every time? I had a lot of cleaning up to do after I realized it was no longer clipping to my default notebook and was just choosing at random. Is it going to happen every time? Don't know, but hope not. At least for now I know to check after an update. Yes, mentioned functions are back (utterly confused why removed in previous version - made no sense at all). Now, new issue: why the search notebook function is case sensitive? Majority of people name their notebooks with capitalization judicially or deliberately, but while doing search, it should be a subconscious process - not thinking "do I need to capitalize this word or not" sort of things. Really. That's fantastic job - as long as "made a lot of people very happy." This " Clipper Team" really deserves a lot of praise: busy removing widely useful function, busy participating user feedback, and finally busy bringing all back, and made a lot of people very happy. How precious is that! As much as I love using Evernote, often mutiple times a day, I won't be surprise this app will be gone or obsolete in a few years. So many fronts of Evernote are so incompetent and nobody is accountable for such moronic actions. And of course, nobody is able to read this - except for forum censors. Seriously? 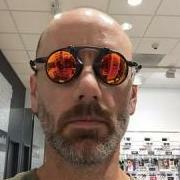 Need to be approved just for a forum post? I strongly suggest employees start looking for another job, if not yet - even YOU - forum censors. Thanks for the update, Chantal. Understandably, there has been a lot of bad feelings about the previous, crippled release. Wondering if you can provide more details about the differenced between 7.1 and 6.13.2? Meaning, what 7.1 includes over 6.13.2...and also what 7.1 still lacks? Also, if you have any insights why logging into your account at evenote.com using Chrome Mac loads your desktop so sloooooow, and very often the page doesn't render at all. This does not happen when accessing an account via evernote.com using Safari, Firefox or Opera. Only when using Chrome. Any insights or suggestions would be greatly appreciated. Type the tag- "abcde", and click enter. Now clip the page. The note synced in the evernote has "null" tag in it. Can you please fix this issue I am quite dependant on tags - I don't want to manually tag the note later in evernote. Thank you for the update. I haven't had a chance to try it yet. I would like to know why the new clipper was introduced in this way. So far, it sounds as if only old features have been restored, not new ones added. Are you trying to create a new tag as you do the clip? Not sure that EN Clipper has ever been able to do that. One has to select from the tags that exist. Could be an enhancement request. The story was apparently that something in Chrome changed, so they needed to scramble and get a rewrite out the door so that you could at least do some web clipping, albeit with some of the old features removed. There was a promise to restore them as soon as possible, which is apparently what's happened (more or less). Hi CalS, Thanks for the response. It is not working with the existing tags, as well as existing tag. Also, in the past, I was able to create new tags from EN web clipper. So, that shouldn't be the problem. Working for me with existing tags, but I can't create a tag using Clipper. Trouble ticket time perhaps. I wasn't disputing that. Just saying I can not create a NEW tag using clipper. Actually no, it doesn't. I opened the clipper (6.13.2) on this page and it copied the title.... Doh. Gotcha CalS. He was referencing setting the default tagging option, which he found that the "fixed" 7.1 has a bug doing. He wasn't referencing creating NEW tags. 7.0 was generally buggy in several ways. When the update first applied, I could select existing tags, AND create new ones. Then that stopped. I could also do screenshots...then that stopped. Bottom line for me...I went back to 6.13.2 and have NONE of those problems any more. I will stay with 6.13.2, and won't update Evernote again until I see convincing reports from this community that they have fixed their programming issues. I'm still unclear as to why 7.0 was even released since clearly, a Chrome update did not "break" the previous version, as someone insinuated. He wasn't referencing creating NEW tags. Not meaning to be argumentative, it was a bit of both. I don't remember ever being able to create a new tag via the clipper, doesn't mean it wasn't so, just probably never tried it. Glad it worked for some at some point. Also, in the past, I was able to create new tags from EN web clipper. Thanks God! Please ask the developers just to release functional code the next time they plan a new rewrite. IMO, the new clip formatting of Simplified Articles is not conducive to reading. Gone is "simplified." There is far too much white space for a fast, efficient scan of text. Please revert to the format I have know since 2011. Thanks. Why do images get distorted in the native apps? That was the story, but it was never officially confirmed. A few users had the impression that this was an unforced error by Evernote. I continue to expereince some significant problems with the notebook search in the new version of Web Clipper (running 7.1.318-ce89aa98) for Chrome. I can see my notebooks on the list, but when I search for them, the clipper can't find it. I've attached screenshots of the problem with my default notebook (0 - Inbox). Help! I've tried clicking "Refresh list" and signing out of Clipper and then signing back in. Didn't help. Try a case sensitive search. Hey - that worked!! Thanks! You are welcome and hopefully they will. A few users had the impression that this was an unforced error by Evernote. Me now thinks it was a rebuild with intent. Why else would I now get a little spinning elephant head when clipper is engaged? Not something one would typically decide to add when responding to an outside influence. Me now thinks it was a rebuild with intent. But a rebuild with intent that started with a service downgrade? 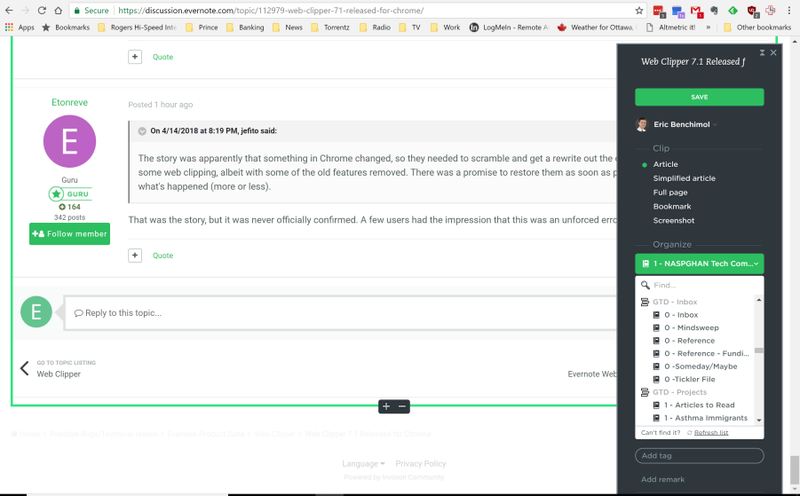 Looking at the extension page in Chrome - https://chrome.google.com/webstore/detail/evernote-web-clipper/pioclpoplcdbaefihamjohnefbikjilc/support?hl=en-US - many people, including me, are having issues where it basically isn't working. Please check those comments. Is there a way to download the pre-upgrade version of the clipper? Clipper entirely stopped working after the update. Don't know what to do anymore!!! I observe, starting today, that the Evernote extension for Chrome (v7.1.0) has yet again stopped working. Is this a known problem? As Evernote for Chrome, of late, frequently stops working for no apparent reason, it would be useful for Evernote staff to maintain a web page at evernote.com that reports the current "Working" or "Broken" status of the Chrome extension. I observe, starting today, that the Evernote extension for Chrome (v7.1.0) has yet again stopped working. Clipper entirely stopped working after the update. Hi. Can you define 'stopped working' a little more clearly? Has the Clipper disappeared, have the choices been changed, is it just not clipping pages? I'll try and herd any other comments to this thread, but AFAIK you're the first to be reporting major issues. Developers -hopefully- will be watching these comments while -presumably- working on further updates for the clipper, so you may get some feedback here. This public forum is -mainly- supported by users. It's read by the developers, but has no link into other support channels. 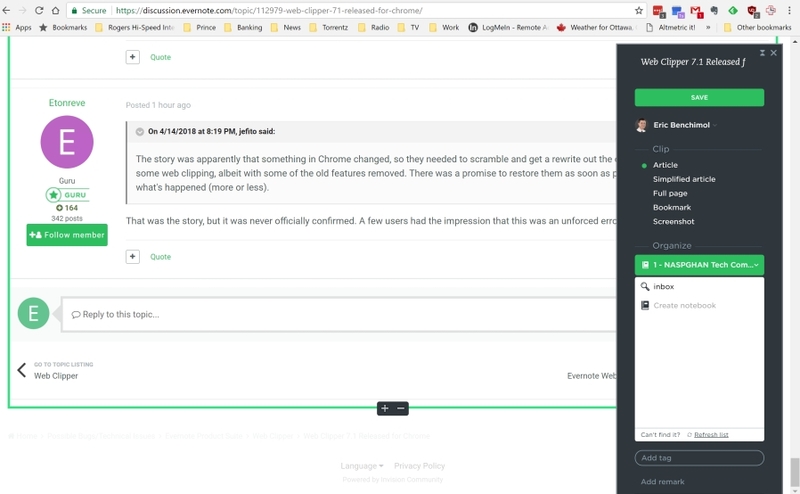 The only sure way to get personal feedback is to raise a query with Support who are available on https://www.evernote.com/SupportLogin.action if you're a subscriber, Twitter - https://twitter.com/evernotehelps if that doesn't work, or you're not a subscriber. @Chantal Leonard I am so relieved to have these features back! However, I did notice that the search function (when searching for a notebook with webclipper) seems to be case sensitive now. So, if I want to find folder "ABC" if have to search in all caps. Can we make the search non-case sensitive? IMO, the new clip formatting of Simplified Articles is not conducive to reading. Gone is "simplified." There is far too much white space for a fast, efficient scan of text. Now, new issue: why the search notebook function is case sensitive? Also, if you have any insights why logging into your account at evenote.com using Chrome Mac loads your desktop so sloooooow, and very often the page doesn't render at all. I am facing a new problem with this version of Web Clipper in Chrome on Mac, where the notes are getting tagged as "null". Are you trying to create a new tag as you do the clip? Not sure that EN Clipper has ever been able to do that. All of the above are bugs or missing features of the latest Ver 7.1. I'm with @snugla1, I'm still on 6.13.2 (downgraded same day I got upgraded, without my permission, to 7.0), and, like every other Evernote product, I'll stay on 6.13.2 until no adverse reports are made with the new, and not-so-improved, EN Chrome Clipper. If many of us are still running 6.13.2 on the latest version of Chrome, what was the urgency to push out a half-baked update? Can you post a link to 6.13.2? I have hunted around but haven't been able to find a download link that actually works. Thanks! When I say Clipper stopped working, I mean it does nothing. I click on it (the extension) and it is unresponsive. I uninstalled and reinstalled it but again nothing. It works perfect in Firefox but it's still the 6.32 version there, whereas Chrome updated to 7.1 automatically and now I can't clip anything! I chatted with EN Support and they said the technical team will look into it and get back to me. I'll post updates here. On my client (Windows 10, Chrome Version 65.0.3325.181) , clipping will begin... and never ends. How can we downgrade? Unless it is a documented problem that can be resolved? Clipper 7.1 works on my MacBook Pro but not on my wife's. We're both running Chrome 65.0.3325.181 on MacOS 10.12.6. Actually, we just upgraded to Chrome 66.0.3359.117 and nothing has changed. Edit: Re-installing the clipper seems to have fixed the problem. Yes, you are right. I deleted, reinstalled and it fixed the problem. I use Any.do task manager. It doesn't connect to Evernote but it is an extension and those tasks also appear on their web.any.do website. I noticed on my home computer that it started sending me from web.any.do to a different website. I asked Any.do why and they said, "Please note that if you're being automatically redirected this means that you have the Evernote Web Clipper installed on your Chrome browser. We've noticed that Evernote's last update made it incompatible with the Web app (and another page also). We're recommending users to contact them in order to request a fix." A second problem is that it is web clipping some sites I use with really huge text and non-white backgrounds. These are mostly subscription websites that I have clipped with Evernote for a long time. But now the titles are huge and the background isn't always white. And if I try to Simply Formatting in 6.11, it runs all the text together. In 6.7.4, it erases the whole note. First screen (Registration for Medical App Makers) is how it used to be, Second screen (Abbot) is now and I don't like this huge text and the fact that I can't fix it. It takes like 2 minutes replace 7.0 (or7.1). Glad it got "published." I agree the bot's job is safe - until Evernote as an entity goes under. My very first attempted post here was not "approved" overnight, probably more than 10 hours after submitting - so I deleted it and wrote another post and the post complaining about censorship. As far as I can remember, I got things posted right away on Google's platform/forum, and numerous other websites. Heck, I could even post something faster on a Chinese website under the censorship of the Great Firewall of China. I guess all of those websites have a sort of bots running behind. Kudos to you gurus. The way you described sounds very enticing and far superior to others and such measurements supposedly work to help Evernote to be a better product. Unfortunately, the user experience does NOT agree. For example, this very Web Clipper fiasco. This is not true, and, like on many occasions before, you are posting wrong info. Old version of the clipper 6.13.0 worked with the newest version of Chrome, and didn't need to be changed because of the Chrome versions. I know this, because I have been using it in this settings. Your post is just confusing more people, why are you doing this, defending the Evernote when they are messing things up. Are you working for Evernote? Thank you so much! One comment - on the Extensions page, you have to enable the Developer Mode switch in upper right to see the Load Unpacked option. I agree with AndreasM here. Instead of some users defending Evernote, for whatever reason, we as a consumer are suffering. It will be good if Evernote hears the consumer complaints, and fixes bugs in the clipper. Whatever is the reason - if people start giving absurd reasons like the rewrite was due to "new version of chrome" and blah, what help it will do to the users? As a user, we don't care why it happened, but it happened. Hope it is resolved soon. Thank you very much for posting this. I am watching your video and doing it now. Thanks for posting this. I get this as well. 83-point font size - very large and very specific. Also very annoying when trying to read posts. Glad to know I'm not the only one. I thought I'd altered a setting inadvertently and have been looking in vain for a way to change it back. Wrong again, @gazumped!!! Evernote management and developers need to be held accountable for this huge mistake, whatever the cause. They need to come clean, be totally honest, fix all of the many issues they have created. Actually, since Ver 6.13.2 still works just fine, I don't know why they don't just revert to that until they have totally fixed, extensively tested, and verified all bugs are fixed. Evernote management and developers need to be held accountable for this huge mistake, whatever the cause. They need to come clean, be totally honest, fix all of the many issues they have created. Your posts seem to be of the beating a dead horse (and @gazumped) style. I am a survivor of many Evernote mistakes, issues, bugs and bad decisions. My experience is that we don't see publicly much evidence of "held accountable" or "come clean". Instead of some users defending Evernote, for whatever reason, we as a consumer are suffering. Uh, we all had to suffer through the (thankfully) short time without the full clipper. In the grand scale of suffering in this world, this event was not really all that bad, though. Let's keep thing in perspective here. If I'm defending anything, it's 1) the right of Evernote to make decisions about the software that they make, and 2) the right of users to use software that works for them. If the rewrite was indeed necessitated by a conflict with a Chrome update, then what they did to get a partially functioning clipper out seems understandable, and yes, defensible. Could they have communicated the situation better to us? You bet. 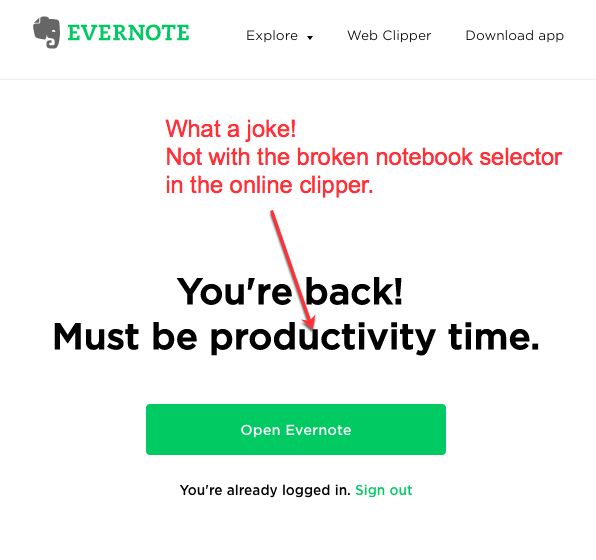 It will be good if Evernote hears the consumer complaints, and fixes bugs in the clipper. Well, your wish is granted, as they already have one major update out that restored most of the original functionality. Hopefully they can now focus on the bugs that have shaken out since. Perhaps that is the problem -- no one is holding Evernote accountable. If you wish to always give Evernote a pass, no matter what they do, then that is on you. Many others of us choose to do differently. Maybe you have not noticed -- but in recent days/months, there has been a new sense of holding those in power accountable for their actions (or lack of actions). Well said, @AndreasM. I don't understand why 2 or 3 Evernote apologists continue to spread false rumors. If you are not sure about your facts, if you can't cite a linkable source, then please don't post. Doing so only adds to the confusion. Evernote has long since lost the integrity to give the the benefit of doubt -- quite the opposite, actually. There is a display issue - the Clipper window appears so low on the page that half of the "Remark" field is cut off and it is also difficult to see scroll for the various notebooks. Running Chromebook, latest version. Update: I went to take a screenshot and now it displayed OK. So will keep you advised. Thank you for returning the Remarks section, very helpful. Edit: I discovered that indeed the bottom section is cut off in that I can't see my notebooks which are low on the list (name of notebook begins with "Y"). However, I will try the option of reducing my screen size (CTRL -) and see if that works. Meantime I setup a workaround ... created a notebook titled "1-WEB CLIPPINGS" and set that as the default notebook where all clippings go. Then I can go there and cut the article to paste to the correct notebook. but have been advised to mention it here, too. It seems that I can no longer use a keyboard shortcut to launch the web clipper. When is this feature going to be reinstated, please? I concur - I do not like it being case sensitive in the web clipper . As I 've posted elsewhere, I have this problem, too, however it's auto-selecting a different font a at 62 point size. Thank you for this explanation. Makes sense. I've been using Chrome, and I've had some of the problems discussed here. Yes, and no telling how many notes I've "lost" that went into that unknowable "smart filing" black hole since April 13? Is there any way to turn off the updating of this extension? I have added 169 notes since then and it will be very difficult to go through all of those to figure out which came from the clipper to ensure proper filing vs which ones I created in other ways. I don't get this smart filing/smart tagging at all. I clipped an email and it tagged it "Twitter". The email didn't even have the word Twitter in it. And it stuck it in my "Work Related" notebook. IT WAS AN EMAIL FROM MY WIFE ABOUT VACATION I NEEDED TO FOLLOW UP ON. I shouldn't have to constantly turn this stuff off over and over and over to not lose things. I want EVERYTHING I EVER DO to go into my @Inbox notebook. Always. No Exceptions. Ever. 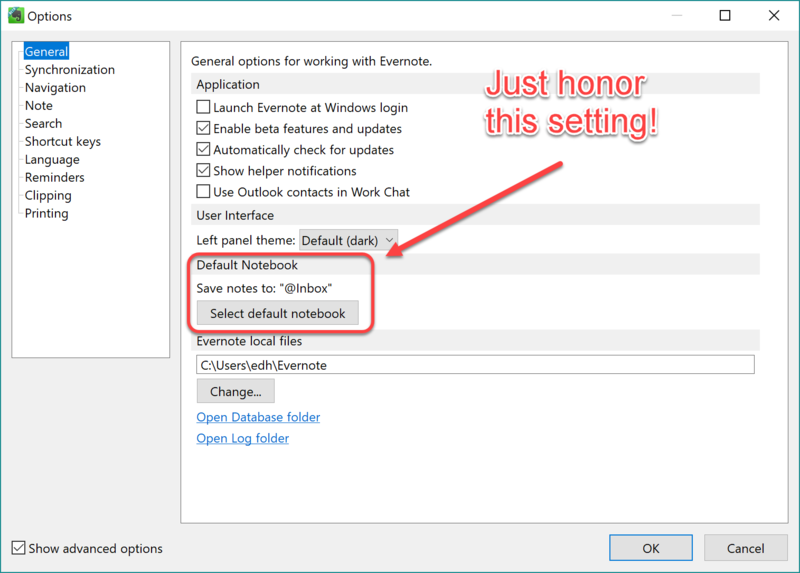 Why do I have to keep fighting Evernote that thinks it knows better? Try source:web* as a search, reverse created sequence. Might winnow it down a bit. Doesn't the following from the Web Clipper options work? Does it get clobbered on update? You are welcome. It should not. They do and it does. Well, the update shouldn't clobber that. I do see the value of having separate settings for the Windows client and the web clipper default notebooks. I use separate ones myself. Web clippings are generally low-priority items for me. I'll read them when I get to them. I'd be ok if it clobbered the update (not really, but sorta) if on first launch of the newly updated clipper it required you to review the settings. But silently deleting them is unacceptable. 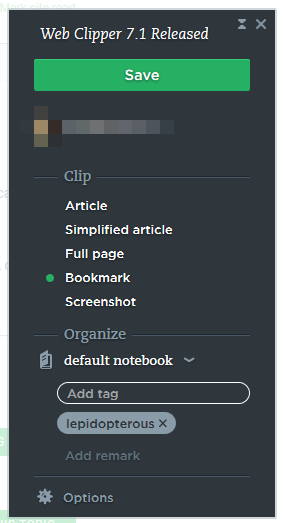 Why does the Web Clipper insist on showing me so-called 'Related Notes' after each clipping. It does so regardless of which settings I select in Options. Why? This annoying feature is useless to me. I have 50.000+ notes. Evernote does not know which ones are 'related' to what I am clipping -- nor do I want to know unless and until I search for them myself. If you have the below unchecked you should not get related notes, under Options in the Clipper. Bug report if you do. With these settings, I still get related notes displayed, however. Seems to be a bug. Try the settings below. 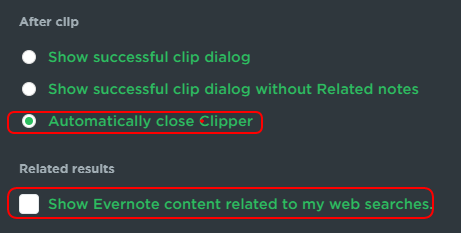 You should get a flash of related notes before the clipper dialog closes. Probably still a bug, no need for the flash either. Thanks. I was actually just curious to see whether it was working or not -- the related notes don't bother me, and I don't think I'd ever turned them off before. No prob. Have always had related notes turned off, no value in my use case and they hide screen. I have discovered a Web Clipper bug and am attaching a screenshot. The options page lacks the ability to scroll to all of the options, the bottom is cut off and you can't scroll further down. Please see screenshot. Running Chromebook, latest version. Other than this the clipper is now back to normal, thank you. EDIT: Discovered workaround, just reduce the size of the font (CTRL AND -); just reduce it to 90% and the entire options screen does show. Just discovered another bug ... formerly you could download (save) a note in Evernote to your computer - just by using CTRL-S. Now that does not work anymore; it does appear to save, shows up on your computer but when you open it the note is blank. I tested my CTRL-S function with other web pages and it works perfectly but no longer in Evernote. My Evernote Premium up for renewal and really thinking about it. I like having 3 devices, and like having more than 60 MB, but maybe I need to think about it, but am frustrated about this and other issues that still have not been resolved (e.g. E-mailing a note doesn't include the URL anymore, Presentation Mode in Windows is worthless). I work in the field of regulatory affairs for software used in medical devices and pharmaceuticals. When my software developers complain about regulation, and the fact they actually have commit in writing what they are going to do and test that it works, I give Evernote as an example of a software you'd never want connected for your medical needs. Clipper: Why did you change the way a notebook is selected for the topic being clipped? Totally useless as is - must scroll through my long list of many notebooks and groups of notebooks. Why did you remove the autocomplete? What were you thinking? Super annoying that you also removed the "Remark" field. When clipping, don't waste your time searching the dropdown list. Just save the item to whatever Notebook EN stupidly suggests. Go to EN (for me, running on my Mac), sort notes by date, most recent first. Refresh / sync if needed to see the note you recently clipped. This is the settings I use. And yes, it is that flash of related notes I referred to. It is unnecessary and annoying. And yes, it is that flash of related notes I referred to. It is unnecessary and annoying. My workaround - I created a notebook 1 Web Clippings and set it as the default to clip to. It is at the top of the list of my notebooks. Now I can quickly access my note and transfer it to the proper notebook. Autocomplete was added back in the updated clipper (that's what the topic is announcing), but at this time it's case sensitive, as has been noted earlier in this topic. ...as is the Remark field. 1. Why autocomplete is case sensitive now??? 2. Why a new tag (created) is not accepted by the clipper???? your are defending the company all the time, it seems you are in good relation with them (if you are not working for them). So why you are not asking them all the questions, why all the good features have been removed? Are you going to follow with them and verify that the features will be restored? Or it will fade away, because people are tired of always bringing back all the bugs, removed features and so on. And, the list is growing with every new release. It's likely an oversight when they pushed out the updated web clipper. I expect that it will be fixed. What did you think was the reason? I do not work for them. I like the Evernote product a lot, have used it for nearly 10 years. As a software developer myself, I defend their right to make software as they see fit (or are able), and determine their product direction. As a software user, I defend people's right to use software that works for them, and to request changes in software they use. Seems simple to me. So why you are not asking them all the questions, why all the good features have been removed? I don't ask those questions because I don't need to know the answers. I note problems when I see them, and that's enough for me, because I believe that they'll be read, and something will hopefully happen to address them. Sometimes I'm curious about what happens behind the scenes (and sometimes I can guess, based on my own development experience), but it's not that big a deal for me, and has no bearing on how I use Evernote. Are you going to follow with them and verify that the features will be restored? Generally I try to keep up, but I don't care about all of the features; mainly just the ones I use. If they claim that a feature's fixed, and it's feasible for me to test it out, I'll give it a whirl and post results if it seems useful. Example: I do a fair amount of web clipping, but I only have a small number of notebooks, and I generally just want to funnel clips to one single notebook for later classification, so case-insensitive notebook matching isn't a big deal for me. But I did check it out when the new release came out, and verified that notebook matching was back, but had the case-sensitivity flaw. I noted it here and moved on. Some people seem to have a burning desire to know whywhywhy? It's just not all that important to me. Or it will fade away, because people are tired of always bringing back all the bugs, removed features and so on. People can make their own decisions. I can't predict what people will do. Or Evernote. I like it and it's working for me now. If it stops, I'll find something else. And, the list is growing with every new release. That's often the nature of software. Your bug database grows over time. Regressions can happen. You do the best you can. That's the way it is in my development world, too. The clipper for Chrome is not working with the new Gmail. The panel seems to work, but the box that comes up with the email info is blank except for "undefined" at the top. The note that makes it to Evernote is just the Undefined text, not the email clipped. Yeah, you can still do an Article clip, but is is incomplete. 'm using Evernote extension on Mac in Chrome. In Safari, when I am on a page and click the little elephant to capture a page to EN, I can use the left/right arrows to move the selection on the page around, and use the up/down arrows to grow and shrink the selection. In Chrome, the arrow keys do nothing. I can click the +/- button to grow and shrink the selection, but the arrow keys just operate the page content as usual and are not intercepted by the extension. This update completely destroyed the notebook search functionality. I would say that it's the most disappointing change to the entire thing. I want to clip something and I want to quickly start typing the first letters of the notebook, and it has zero accuracy. Even if I type the exact name of the Notebook it claims that it doesn't exist. So then I manually scroll through all of my stacks and notebooks and there it is. The previous version was perfect in terms of usability on this feature and it got completely destroyed for a power user like me. As you can see from the attachment I type the word, "Recipe" and it shows nothing. Then in the second attachment I scroll down to show that it recognizes that the Recipe's notebook does in fact exist.